A huge crowd gathered for the 6th Filipina Entrepreneurship Summit, held at the World Trade Center in Pasay City on March 7. As expected, it reinforced the entrepreneurial spirit of Filipino women through positive mindset, inspiration, and more entrepreneurial insights. <>Some of the most popular names in business, entertainment and media industries, and politics gathered as speakers and moderators for the ’Sixth Filipina Entrepreneurship Summit 2014.’ That was why the World Trade Center in Pasay City was jam-packed Friday morning (March 7, 2014). As expected, the event focused on reinforcement of the entrepreneurial spirit of Filipino women through setting positive mindset, providing more inspiration and entrepreneurship insights, and presenting new concepts and tools to help them succeed. The activity also continued what has become its annual tradition of recognizing outstanding Filipino women for their remarkable roles as catalysts for further change and progress. 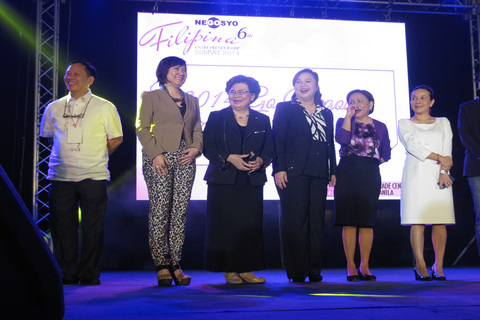 RFM chief executive Joey Concepcion, who founded Go Negosyo, welcomed all participants and guests to the summit. Celebrity entrepreneur, TV host, and ’Queen of All Media’ Kris Aquino gave her special (and energetic) message about the important roles of women in the society and in the local business landscape. Senator Grace Poe delivered a keynote message afterwards. 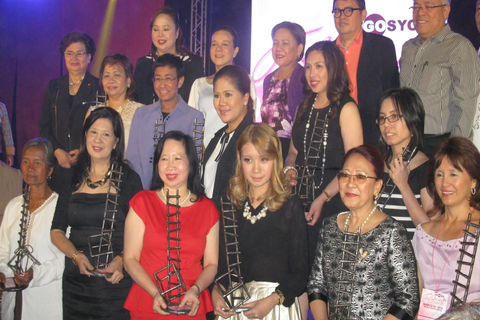 The highlight of the morning was the awarding of the ’Go Negosyo Filipina Starpreneurs of 2014.’ This year, the Philippine Center for Entrepreneurship recognized 10 outstanding Filipino women for their significant contribution and notable success in various industries. The recipients of the awards were screened and selected by a special panel of judges (Santa Elena Construction and Development President Alice Eduardo, Richwell Trading Corp founder and CEO Myrna Yao, and W Buildings owner Rosalind Wee). In the afternoon, veteran newscaster Korina Sanchez talked about finding and pursuing one’s passion. The forum that followed focused on successful business ideas and models in food, restaurant, IT, and retail industries. It was moderated by celebrity entrepreneur RJ Ledesma and Chal Lontoc. Entrepreneur.com.ph was a media partner for this event.